Meet pets with a very special job. They are the Guardians of the Sailor Scouts, Champions of Love and Justice. They are to protect and advise the Scouts in their mission to fight evil. 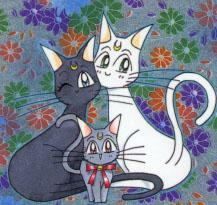 In the Moon Kingdom of Queen Serenity, Luna and Artemis were her trusted advisors. After sending the children of the Moon to Earth, she told Luna and Artemis that they were to seek out the Scouts if the Negaverse should become free. A thousand years later, they must awaken the Scouts to save the Universe. Sailor Moon's guardian cat. She is the one who discovers Serena is Sailor Moon. She is also the one who discovers Ami, Rei, and Lita are Sailor Mercury, Sailor Mars, and Sailor Jupiter, respectively. Luna keeps (or tries to keep) Serena's mind on Scout business and school. She is often the one to find the new enemy. She is transformed (for a short time) into a human in the S movie. Artemis is Sailor Venus' guardian cat. He is the one who first discovers Mina is Sailor V. After, she moves to Japan, he meets up with Luna and introduces toe rest of the Scouts to Sailor V who was now called Sailor Venus. He helps Luna figure out new enemies, while keeping (or tying to keep) Mina's mind on Scout business not boys. 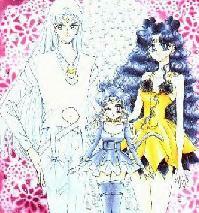 Diana is the future daughter of Luna and Artemis, born in the 30th Century. She is Rini's guardian and accompanies her on one of her trips to the present. Together, the two learn and train for their futures. Luna-P is Rini's first Guardian. The ball has special powers which she activates by saying "Kitty Magic" or Luna Sphere Kitty Magic". The ball also allows Rini to talk to Sailor Pluto. Phobos and Deimos are Rei's pet crows. They protect her and warn her of dangerous situations. *This picture is from the magna. Therefore, the eye colors will differ from the profiles.